Order your Hosa USQ TRACKLINK Guitar to USB Interface 1/4 Inch TS to USB Type A from AMS and enjoy Fast & Free Shipping. Get the Best Deal with our Lowest Price Guarantee & Great Customer Service! 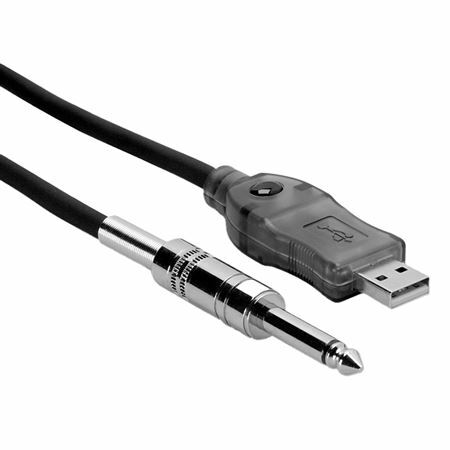 Easily plug your guitar or keyboard directly to your computer with the Hosa TrackLink cable. Simply plug the 1/4 inch connector into your instrument and the USB connector into your computer and play. You will be tracking in no time! The TrackLink work s with electric guitars, basses, keyboards and pedal effects. The TrackLink will work with an electronic musical instrument with a mono phone output. Use your existing software to process your sound or, if you use guitar pedal effects or signal processors, simply plug the instrument end into the last effect in your signal chain. The on-board analog-to-digital converter will faithfully reproduce your sound in CD-quality. It’s that easy!